I’m going to teach you how to make your “About Me” page work for you. Allowing you to grow your list, increase your community and get more clients. My favorite place to learn about the people I’m interested in doing business with is by reading their story on their “About Me” page. This is the space where you can learn about who they are at the core, how they handle life and decide if you want to get to know them more and do business with them. It’s all about getting to know, like and trust them. It’s simple. In my 9-step process we will introduce ourselves, share what we do, uncover what your story is, connect it to your audience and give them the answers they need to start building a relationship with you. Write a short sentence or two to make them feel comfortable. I love this one, it’s the perfect introduction weather your introducing yourself at a networking event, on social media or onto your website. Hi, I am (Name) and I’m a (Insert Title). I help (who do you desire to help) to (what immediate struggle does your client need to overcome) by (what is your solution you provide) so they (clients big goal or dream). It all starts with you. Spend some time thinking about you. What are 3 transition stories that you can share to help explain how you started your business. If you get stuck write the ending first, where are you at today, and work your story backwards. Always write in first person so that they can easily relate to you and your journey. If you find that you’re having trouble writing it out I suggest focusing on the key points of the transition. Create a small professional bio on your “About Me” page, written in 3rdperson that you can use for interviews, or speaking opportunities. Having this built into your page, makes it easy for those that need to introduce you, as its readily available and can be pulled up from anywhere. You’ve gotten them to your page, and they took the time to read about you and your story. So now you have the perfect opportunity to invite them over to check out your services or to schedule a call with you. What do you want them to do, give them a call to action (CTA), invite them to schedule a call, check out your offerings, connect on social media or download a gift? I encourage you to have a free offer/opt in at the middle or end of your page that your audience can access right away. Allowing you the perfect opportunity to start developing a relationship with them. It’s so important to have their email so that you can share value, let them know about your programs and make sales. Remember to use pictures of you or your products that are consistent with your brand that shows your unique personality. Download my free workbook now. 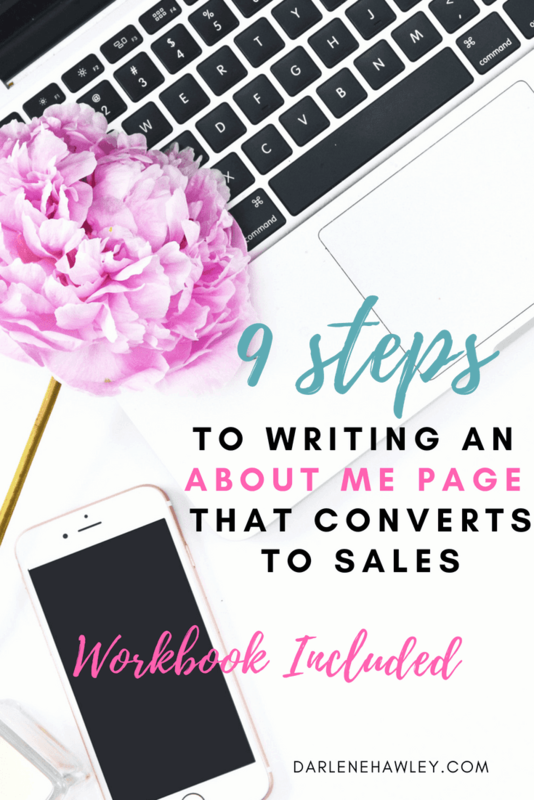 By the time your finished filling it out you will have written your “About Me” page and you will start attracting your ideal clients and start growing your business. Ps. BONUS- Schedule a 20-minute Mini Session with me and I will review your About Me Page with you for free after you have completed the workbook. Send an email to [email protected] to schedule now. Pss. Let’s get connected? Join my amazing community Attract & Stand Out Brand Building with Darlene Hawley and start building authentic business relationships. Darlene Hawley is a mother, wife, connector and dream builder. She is also a Brand & Business Clarity Coach and the founder of DarleneHawley.com. She empowers women entrepreneurs to embrace their unique story so they can share their message in a way that helps them increase visibility and takes their business to the next level, allows them to build a brand that attracts and stands out. Before starting her own business, she worked her way up in big box retail management, was a mortgage loan officer, and a financial coach. Darlene was trained by the largest business coaching franchise in the world and has been committed to helping entrepreneurs launch and grow their business since 2007. She now spends her time supporting women to reach their goals and live out their dream life, all while raising her family and creating memories each and every day. She empowers women entrepreneurs to embrace their unique story so they can share their message in a way that helps them increase visibility and takes their business to the next level while making an impact in the world. Let's build a brand that attracts and stands out.